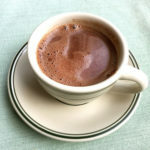 February was National Chocolate Month, so I took it upon myself to do as much sampling of different forms of chocolate as was humanly (and healthily) possible, including that magic and luxurious elixir of winter — hot chocolate. Marble cake offers the best of both worlds, well, at least the best of both flavors — vanilla and chocolate cake batters are swirled together to bring two favorite tastes in one. Someone always has too much zucchini. Thankfully. Because if you have a food-loving, gardening circle of people populating your world, you can benefit from this abundance. This summer, I have been graced with others’ extra tomatoes, peaches, yellow squash, golden cherry plums and zucchini, and have not wasted a morsel.